Mulder and Scully are called into Deputy Director Kersh’s office, who asks “Where is he?” Legitimately confused, they learn that Assistant Director Skinner has gone AWOL. Going to his apartment, they discover a very clean place with no personal effects. Scully finds an open envelope addressed to “Lance Corporal Walter Skinner”. She is shocked to find it contains a human ear, along with a note reading “The Monsters Are Here”, and a newspaper from the town of Mud Lick. Scully requests information on Skinner’s Vietnam experience, but it is denied as being Top Secret. Arriving in Mud Lick, Mulder and Scully learn that the ear came from the town doctor, Dr. Matthew Wegweiser. He was snared in a hunting trap on a local hiking trail. It is unknown why the ear was removed, but it is noted that he was also missing teeth. They also find out about a local mental hospital, the Glazebrook Institution, where some Vietnam vets had been sent. 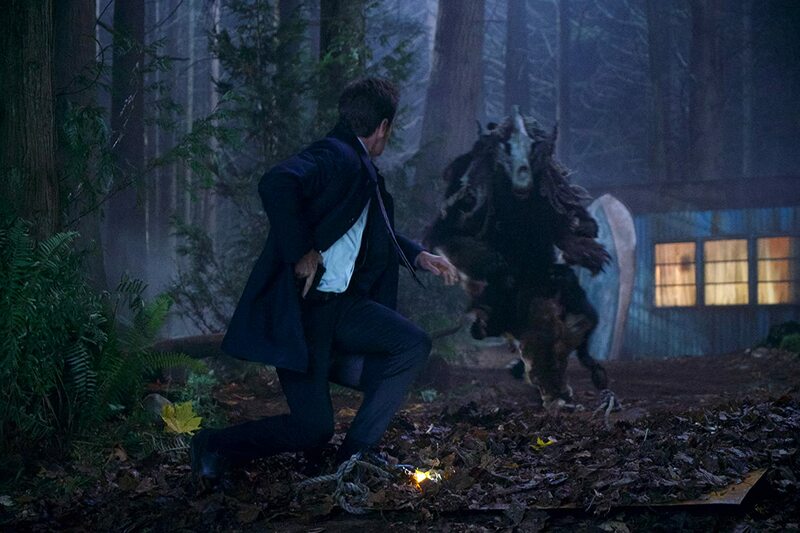 A man is hunting in the woods, while a large creature is skulking about. It looks like a bear walking on hind legs, with large horns. His dog barks and whines. The hunter falls into a pit trap, impaled on Punji sticks. Sometime later, we are able to see the results of the trap when a man shines his light down into it: Walter Skinner! The hunter is retrieved and examined in town; he too had been losing some of his teeth. A deer cam was also found at the scene, odd because the property owner supposedly never used one. The police retrieve the footage, which shows the hunter’s fall, then Skinner, and then the ‘monster’. Skinner comes to a trailer in the woods and goes inside. He finds a picture of John along with a child and woman, whose face is cut out. Looking through an album of Vietnam pictures, the labels indicate that John was nicknamed “Kitten”. In a flashback, John is telling a gruesome story, showing that he is collecting enemy soldiers’ ears. His mouth starts bleeding and he pulls out a tooth, noting that it was the third one that week. Skinner is nearby cleaning a rifle, and sees a Vietnamese man sneaking up to the others with an IED. Skinner yells, the Marines duck, and he shoots the man. Back in the present, a young man who resembles John enters the trailer. It is Davey, his son. In a tense conversation, Davey explains that John was sent to Glazebrook and stayed 38 years, largely because of Skinner’s testimony at a court martial. Skinner said he was obeying orders to not talk about the gas. John had told Davey about it, though, how it created images from one’s fears and caused him to see monsters. Skinner thinks that John is behind the killings, and being hidden by Davey. 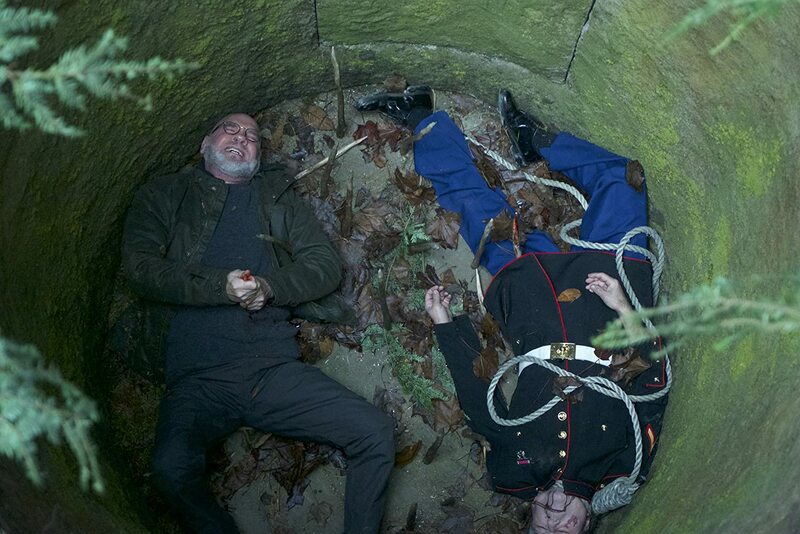 Davey takes him into the woods that night, showing him John’s body, hanging from a tree in a dress uniform. Distraught, Skinner walks to him and falls into a pit trap. Davey cuts the rope, dropping John in with him, and then covers it. Mulder and Scully are able to get John’s name, but no military information, so they go to the trailer and find Davey. He puts on a record to create background noise and seems edgy to their questions. 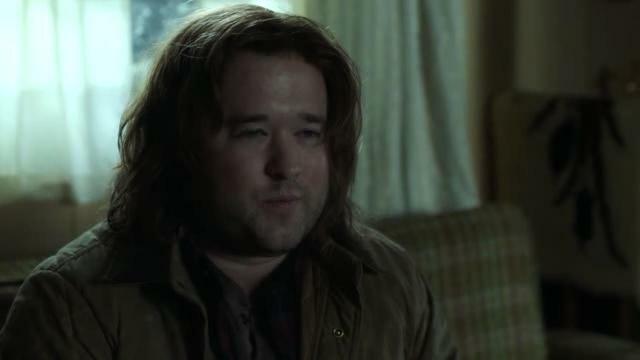 Asking about Skinner and John, Davey claims not to know Skinner, and that he has not seen his father in weeks. Mulder had seen Skinner’s SUV and the labels in the photo album, and was quite suspicious. Stopping a short distance away, he tells Scully to call the sheriff while he sneaks back. Creeping into the trailer, he finds a monster costume in the closet. The record stops and Mulder can faintly hear Skinner yelling. After he runs out to investigate, the monster costume leans upward! Mulder finds the pit and Skinner tells him to go away, but the monster/Davey appears and pushes him in. Davey pours in gasoline but is shot by Scully before he can light it; moments later, though, he disappears. 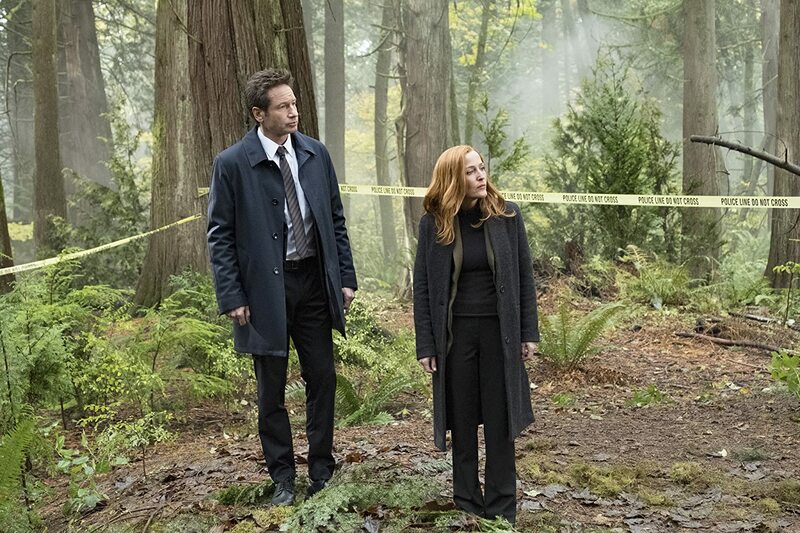 Mulder and Scully hunt him in the forest, where he is hiding near an overhead spike trap. Skinner appears out of nowhere, fights him, and drops the trap on Davey, killing him. “Imagine the power of a government that could literally control the minds of millions and millions of its citizens, simply by exposing them to this poison. It’s happening. It’s happening right now!” The plane starts to spray as the screen fades out. – Having been told to get the sheriff, Scully is shown failing to get cell phone service while still about 8 miles outside of town. This had me presuming she was going to continue and take a long time to return with backup. Breaking a common trope, it was a pleasant surprise when she showed up as quickly as she did. 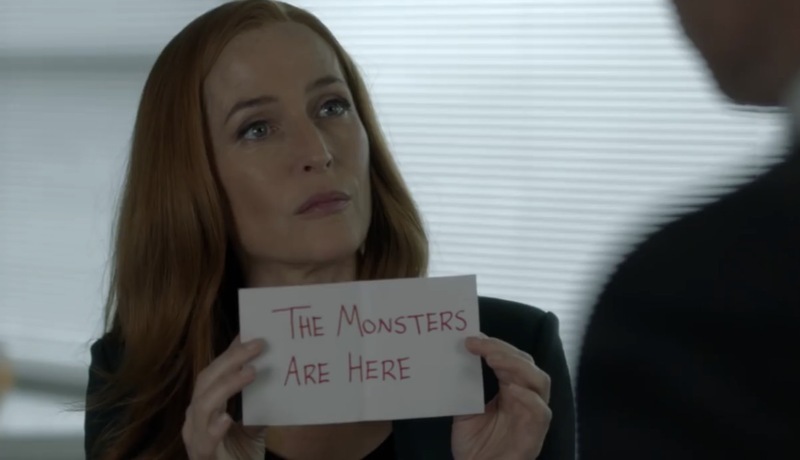 – After rescuing Skinner from the pit, Scully mentions Kersh’s claim that his loyalty to her and Mulder has stalled his FBI career. Skinner replies, “If it wasn’t for you two, I wouldn’t be here right now.” The line works on two levels: the most obvious one being that they rescued him from the pit. Skinner goes on to explain that he enlisted in the Marine Corps at 18 thinking he was doing the right thing, while noting that John was drafted. He wanted to protect John, but could not. The Vietnam experience planted seeds of mistrust in the government. At first trying to bury those feelings, getting to know Mulder and Scully taught him to instead shine light into the dark corners, determined to find truth. – Walking outside the trailer after that conversation, Skinner reaches into his mouth and removes a tooth. – I give this episode a B. Technically a “monster of the week” story, this one does play into a wider realm that most of them do not. If it were isolated, I would have graded a bit lower, however the deep dive into Skinner’s past made this a more engaging episode. Nick Monitto has been a sci-fi geek for a few decades now, having watched the original “X-Files” in its day. He is not feeling paranoid after watching this episode, not at…what was that sound?